Bee and Wasp Pest Control Sydney, Australia. It is well known in our community that Bees and Wasps are beneficial to our environment. Bees will help to pollinate flowers. Wasps are the main adversary of spiders and other types of insects. If they are not dealt with swiftly when they pose a prolem, bees and wasps may create a danger. These types of insects have stings that are very painful. Some persons have severe allergic reactions which can need medical attention. Wasps are known for very aggressive behaviour when disturbed by humans. Wasps known as European Wasps are very aggressive. They are commonly called ‘Killer Wasps’ in different parts of the world. Bees are not generally as aggressive. ‘Africanized Honey Bees’ or aka ‘Killer Bees’ have been known to attack and to take the lives of their victims. There are many methods to get rid of bees and wasps. These include nest control, chemical hive control and deterrant service spray. Controlling the nest maybe difficult for bees and always wasps. Physical removal or relocation may be the method used by bee catchers or apiarists but sometimes the chances of the nest being destroyed or injured can occur. Chemical sprays can be used to kill the bees and wasps. There are many commercial standard sprays at any home and garden store and most supermarkets carry these as well. Make sure that bees or wasps are on the label, you adhere to all warnings and they are registered products. Professional services, the exterminator services, are needed when bees and wasps have nests that are in extreme places such as inside a home, inside the insulation or high in trees or in hard to reach places. These services have varied costs depending on the service needed so call around to find out the range of costs. All wasps will have a very slender body with a narrowed waist, slender legs, and they will appear as smoothed skinned & of a very shiny colour. European wasps, Hornets, Paper Wasps and Yellow-jackets, are by far the most common wasps seen in Australia by most people. Bees are of a more robust body & somewhat hairy when compared with the wasps. Bee rear legs are flat for the collection and the transport of pollen. Honey bees polinate over 80% of our fruits, vegetables, and legumes. Wasps are well known predators, and the main killer of spiders. They will feed on insects which they also bring to their young, which will grow in their nests. They are beneficial to mankind as they will prey on caterpillars, cockroaches, ants, flies, crickets, and many other insect pests. During the late Summer and early Autumn, as their queens stop laying their eggs, wasps may change their food preferences and will gather sweet sugary food & other carbohydrates. Scavanging wasps will eat human food and be a pest around barbeques and picnics where food/drinks are presented. Bees on the other hand will feed only on nectar from which they get carbohydrates, and pollen where they obtain protein. Both wasps and Bees will visit rubbish bins and feed on soft-drink cans to get their sugary “fix”. Most wasps will make their nests from chewed-up wood fibres that are mixed up with their saliva. Mud wasps and Yellow-Jacket nests have a series of round comb-like structures that are stacked in tiers. Several layers of pulp cover an envelope of material. Paper wasps are known by some people as “umbrella wasps” because of the way that they shape their nests. European wasps will build their nests in gardens, trees, and under eaves of buildings. Paper wasps will build their nests under horizontal surfaces of buildings & are found on eaves, beams, roof voids, garages, barns, and commonly in outbuildings and sheds. Honey bees often make vertical honey combs that are made of wax. They will nest in cavities in trees, wall voids, or other area protected from the weather. Mortar bees will commonly use old rodent burrows to build their nests. Bees normally have hives that only last for 1 year. The colony will die in Autumn with the new queens surviving the cold of the winter. The new queens will leave their colonies during the late Summer & will mate with the kings. The queens will then travel to small holes and spaces protected from the weather, where they then become dormant. They will become active next Spring when the temperatures will warm up. They then forage for nesting sites to construct new nests. They don’t re-use old nests. Honey bees don’t ever survive more than 1 year. As the median temperature drops, clusters of bees become much more compact. Bees living inside this mass will eat honey and then generate their own heat so that their mates in the cluster do not freeze. Bees and Wasps will sting in order to defend themselves, or defend their colony. Stinging will involve the injection or multiple injections of protein venoms that will cause severe pain and other bodily reactions. Wasps and also Mortar bees may sting several times because of the fact that they are able to retract their stingers without any injury to themselves. Strangely, If you are unfortunate enough to be stung by wasps or bumble bees, their stingers are not left anywhere inside your skin. Very rarely there are ocassions where a person may likely suffer a life-threatening allergic reaction to bees or a wasp sting. This may cause “anaphylactic shock” – symptoms are fainting, with difficulty breathing, abnormal swelling, & a blockage in the throat area with only minutes of being stung by these insects. If you are one of these persons, you wil require immediate medical attention. The first step in wasp or bee control is to correctly identify the insect and locate its nesting site. 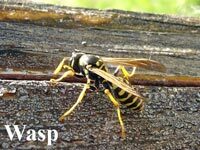 An experienced pest control service may provide wasp / bee control service or you can use the following information to attempt to control them yourself. The very best time of the year for Wasp Treatment is in September/October in Australia, just after the queen has built her colony and sensibly while the hive is only still quite small. The problem is then however, they will be also harder to find. The very best time of the day to get control over wasp nests is at night, but that might not suit everyone. It has been revealed by scientific testing that at temperatures below the 5° C level, wasps will have difficulty just trying to fly. Never attempt to seal a wasp nest, there are no surviving wasps inside. If nests aren’t discovered until the Autumn, control may be then unnecessary as the imminent freezing temperatures will certainly kill the colony. Is YOUR home protected? Remember A1 Pest Control for your home’s complete bee and wasp protection systems. Simply 0417 251 911 or email today for more information, advice and FREE QUOTES! Call today to find out more information with no pressure to order our services on 0417 251 911 or send us an email at bruce@a1pestcontrol.com.au for a free quote and advice.